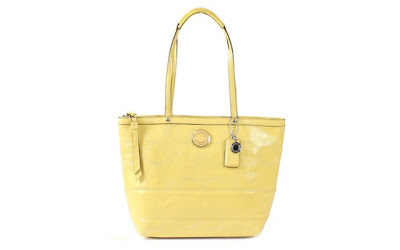 The Coach Signature Stripe Stitched Patent Leather Tote Bag (19198 Yellow) is currently selling for just $208.15 on Amazon.com! You will be saving 37% off the regular price of $328.00 with this Coach bag deal. Approx. 14" x 9 3/4" x 4 1/4". Approx. 17" strap with 8 1/2" drop. Outside back slip pocket. Inside zip pocket and multifunction slip pockets.